Dr. Xiaoping Chen, received his medical degree (M.D.) in Clinical Medicine from Guangdong Medical College in 1980, M. Sc. in Infectious Disease from Sun Yat-sen University of Medical Sciences (SYSUMS) in 1988 and Ph.D. in Pathogen Biology from SYSUMS in 1998; and during his Ph. D. research program, he studied and worked at the University of California at Los Angeles (UCLA, USA) as a visiting scholar in 1997. Dr. Chen worked as a physician in the field of infectious disease at the Affiliated Hospital of Guangdong Medical College from 1980-1985, as a research assistant/associate, associate investigator and the director at the Department of Microbiology at Guangzhou Disease Control and Prevention (Guangzhou CDC) from 1988-1995; as an associate investigator, principal investigator and the director at the Department of AIDS Control and Prevention, the director at AIDS Research Laboratory of Guangzhou CDC from 1998-2004; as a visiting professor at SYSUMS since 2002. Dr. Chen joined Guangzhou Institutes of Biomedicine and Health (GIBH), Chinese Academy of Sciences at beginning of 2004 as principal investigator at the Laboratory of Pathogen Biology and the director of Center for Emerging Disease/Center for Infection and Immunity, as a professor at the Department of Medical Biotechnology, a joint faculty of GIBH and the University of Science and Technology of China (USTC). 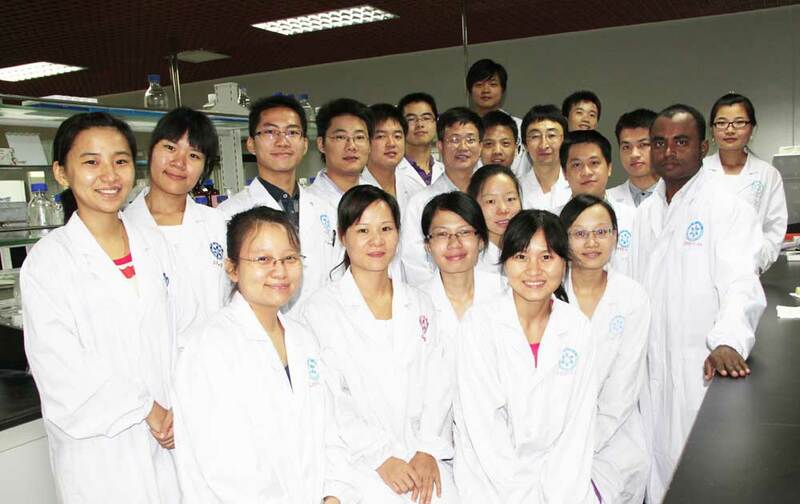 Since 2010, Dr. Chen has been the deputy director of the State Key Laboratory of Respiratory Disease, a joint state key lab of GIBH and Guangzhou Medical University. Dr. Chen is a pioneer in the studies of interaction between malaria and HIV/SIV infection, malaria and cancer, HIV protease inhibitors as antimalarial agents and Plasmodium-based AIDS vaccine. Sixteen members at the Laboratory of Pathogen Biology including research assistants/associates and graduate students, the individual information and photos are linked at: Individual information for the chen Lab. The Laboratory of Pathogen Biology is focused on the studies of three major diseases (malaria, AIDS and cancer) and their interactions. Our animal model studies have demonstrated that malaria infection induces strong innate, cellular and humoral immunities. 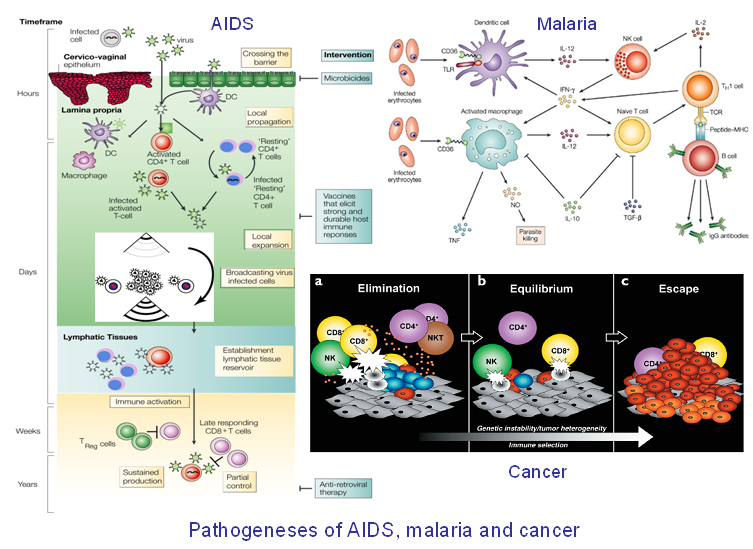 For example, malaria infection displays anti-tumor effects by inducing both a potent anti-tumor innate immune response, including the secretion of IFN-γ and TNF-α and the activation of natural killer cells as well as adaptive anti-tumor immunity with increasing tumor-specific T-cell proliferation and cytolytic activity of CD8+ T cells. Some contents of malaria parasite such as glycosylphosphatidylinositol (GPI), microparticle (MP) and hemozoin (HZ) have been shown to combine with TLR2, TLR4 and TLR9 of immune cells to induce the innate immune responses and the down-stream antigen-specific immune responses. Thus, malaria parasite is a natural combination form of immune adjuvants. Our published results also demonstrate that malaria parasite can efficiently express HIV protein (Gag) and that infection with the recombinant Plasmodium induces strong Gag-specific CTL response and protects the immunized mice from the challenges with Gag-expressing vaccinia virus and malaria parasites. The genome of Plasmodium is much larger (may contain more foreign antigen genes) than those of bacteria and viruses which have been often used as vaccine vector. Therefore, we are further exploring the feasibilities of Plasmodium-based immunotherapy for cancer, new form of malaria vaccine and Plasmodium-based AIDS vaccine. In addition, we are also exploring the feasibility of CCR5-disrupted cells as a gene therapy for AIDS patients. Our published data demonstrate that HIV protease inhibitors (HIV-PIs) have some antimalarial activities and display synergy with chloroquine in vitro and in vivo. Our recent monkey model study indicates that one of the HIV-PIs, indinavir displays a prospect in the prevention and treatment of malaria. Currently, we are further developing antimalarial drugs based on a new target, plasmepsin V in collaboration with the scientists at Saint Louis University and Washington University, see the link: Inhibitors of Plasmepsin V as Novel Anti-Malarial Agents. 3) Malaria vaccine and antimalarial drug development platforms. Zhan XY, Wang N, Liu G, Qin L, Xu W, Zhao S, Qin L, Chen X. Plasmodium infection reduces the volume of the viral reservoir in SIV-infected rhesus macaques receiving antiretroviral therapy. Retrovirology. 2014, 9; 11 (1): 112. Hu W, Song H, Sae Her A, Bak DW, Naowarojna N, Elliott SJ, Qin L, Chen X, Liu P. Bioinformatic and biochemical characterizations of C-S bond formation and cleavage enzymes in the fungus Neurospora crassa ergothioneine biosynthetic pathway. Org Lett. 2014, 17; 16 (20): 5382-5. Meyers MJ, Tortorella MD, Xu J, Qin L, He Z, Lang X, Zeng W, Xu W, Qin L, Prinsen MJ, Sverdrup FM, Eickhoff CS, Griggs DW, Oliva J, Ruminski PG, Jacobsen EJ, Campbell MA, Wood DC, Goldberg DE, Liu X, Lu Y, Lu X, Tu Z, Lu X, Ding K, Chen X. Evaluation of aminohydantoins as a novel class of antimalarial agents. ACS Med Chem Lett. 2013, 6; 5 (1): 89-93. Yao Y, Nashun B, Zhou T, Qin L, Qin L, Zhao S, Xu J, Esteban M, Chen X. Generation of CD34+ Cells from CCR5-disrupted Human Embryonic and Induced Pluripotent Stem Cells. Human Gene Therapy. 2012, 23: 238-242. Li Q, Ruan Z, Zhang H, Peng N, Zhao S, Qin L, Chen X. Characterization of peripheral blood T lymphocyte subsets in Chinese rhesus macaques with repeated or long-term infection with Plasmodium cynomolgi. Parasitol Res. 2012, 110 (2): 961-9. Chen L, He Z, Qin L, Li Q, Shi X, Zhao S,Chen L, Zhong N, Chen X. Antitumor effect of malaria parasite infection in a murine Lewis lung cancer model through induction of innate and adaptive immunity. PLoS ONE. 2011, 6 (9): e24407. Li X, He Z, Chen L, Li Y, Li Q, Zhao S, Tao Z, Hu W, Qin L, Chen X. Synergy of the antiretroviral protease inhibitor indinavir and chloroquine against malaria parasites in vitro and in vivo. Parasitol Res. 2011; 109: 1519-1524. Wang B, Li Q, Qin L,Zhao S, Wang J, Chen X. Transition of tumor-associated macrophages from MHC class IIhi to MHC class IIlow mediates tumor progression in mice. BMC Immunol. 2011; 12: 43. Li Y, Qin L, Peng N, Liu G, Zhao S, He Z, Chen X. The Antimalarial effect of human immunodeficiency virus protease inhibitors in rhesus macaques. Antimicrob Agents Chemother. 2011, 55: 3039-42. You J, He Z, Chen L, Deng G, Liu W, Qin L, Qiu F and Chen X. CH05-10, a novel indinavir analog, is a broad spectrum antitumor agent that induces cell cycle arrest, apoptosis, endoplasmic reticulum stress and autophagy. Cancer Science. 2010; 101:2644-51. He Z, Chen L, You J, Qin L, Chen X. Antiretroviral protease inhibitors potentiate chloroquine antimalarial activity in malaria parasites by regulating intracellular glutathione metabolism. Exp Parasitol. 2009; 123:122-127. Shi X, Qin L, Liu G, Zhao S, Peng N, Chen X. Dynamic balance of pSTAT1 and pSTAT3 in C57BL/6 mice infected with lethal or non-lethal Plasmodium yoelii. Cell Mol Immunol. 2008; 5:341-348. He Z, Qin L, Chen L, Peng N, You J and Chen X. Synergy of human immunodeficiency virus protease inhibitors with chloroquine against Plasmodium falciparum in vitro and Plasmodium chabaudi in vivo. Antimicro Agents Chemother. 2008; 52: 2653-56. Zhang L, Yan K, Zhang Y, Huang R, Bian J, Zheng C, Sun H, Chen Z, Sun N, An R, Min F, Zhao W, Zhuo Y, You J, Song Y, Yu Z, Liu Z, Yang K, Gao H, Dai H, Zhang X, Wang J, Fu C, Pei G, Liu J, Zhang S, Goodfellow M, Jiang Y, Kuai J, Zhou G and Chen X. High-throughput synergy screening identifies beauvericin as a novel combination agent for the treatment of fungal infections. Proc Natl Acad Sci USA. 2007; 104:4606-4611. Chen XP, Cao Y. Consideration of highly active antiretroviral therapy in the prevention and treatment of severe acute respiratory syndrome. Clin Infect Dis. 2004; 38: 1030-1032. Chen XP, Li GH, Tang XP, Xiong Y, Chen XJ, Cao Y. Lack of severe acute respiratory syndrome in 19 AIDS patients hospitalized together. J Acquir Immune Defic Syndr. 2003; 34: 242-243.